But is it really that simple? 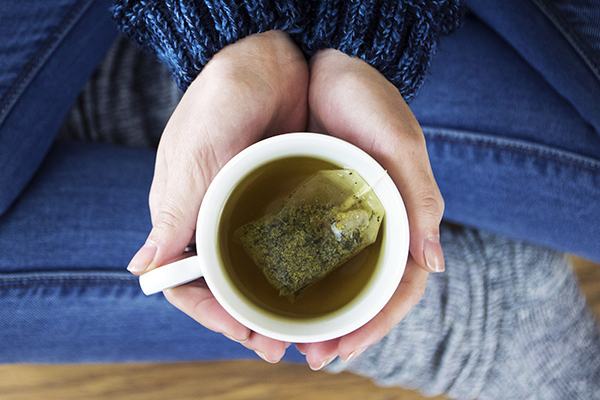 Could a tea detox — or teatox, if you will — be just what you need to finally lose the extra weight? If you’ve ever been tempted to purchase a teatox package for yourself, read on to learn more about what it is, what it can do to your body, why it’s not an effective long-term weight loss solution, and what you to do instead. Detox tea, according to the companies who sell it, is a blend of herbs and leaves designed to help boost your metabolism, reduce bloating, flush out toxins, increase your energy, and improve your digestive system. The more accurate description of detox tea, however, is just regular old tea packed with a few extra herbs and ingredients that may or may not help you lose weight, depending on your lifestyle, exercise habits, and diet. Most companies who sell detox tea offer two blends: a caffeinated morning beverage that you’re supposed to drink every day after you wake up, and an herbal nighttime blend to sip every other evening before bed. “There aren’t magic bullets when it comes to eating a healthy diet and losing weight,” says Amy Gorin, M.S., RDN, and owner of Amy Gorin Nutrition in Jersey City, NJ. Detox tea is no exception. Its commercial appeal is understandable — just drink it twice a day and you’ll be skinny! — but the truth is that no one food or drink is responsible for weight loss. While Gorin says some studies show that green tea may help minimally with weight loss and weight maintenance, she says she’s seen no evidence to back up the health claims that detox tea companies make. In fact, there is currently no credible scientific research available to suggest detox teas actually contribute to weight loss. Significant, long-lasting weight loss happens as the result of multiple factors, least of which is drinking tea. “Of course, when you couple tea drinking with eating a healthy, balanced diet and regular exercise, that weight loss may be greater — but that could be said of any unsweetened tea, not necessarily a detox tea,” says Gorin. One of the main ingredients in detox tea, particularly in the nighttime blend, is senna, an FDA-approved natural laxative used to treat constipation and induce bowel movements. These laxatives, especially when combined, can cause you to, ahem, need to use the bathroom frequently. Most detox tea products even warn consumers not to schedule a date or special event for the period of time after you drink your nighttime cup. To put it bluntly: You’re probably going to need some privacy and easy access to a toilet. Beyond the inconvenience and potential discomfort of having multiple bowel movements in one evening, these laxatives can also have other unfortunate side effects if consumed in excess. Too much senna may cause abdominal pain or discomfort, bloating, nausea, diarrhea, gas, or cramps, says Gorin. More worryingly, “excessive use can [also] bring about depletion of potassium, an important mineral; and this may cause muscle spasms and abnormal heart rhythm,” she adds. The typical morning detox tea has a green tea base with a blend of herbs like yerba mate, nettle leaf, dandelion leaf, guarana seed, rhubarb root, or lotus leaf. Green tea leaf and yerba mate both contain caffeine, as does guarana, an Amazonian plant often used in energy drinks for its stimulant properties that rival those of coffee’s (guarana seeds contain approximately four times the amount of caffeine found in coffee beans). Something to keep in mind, according to Gorin, is that any weight loss you experience after drinking detox tea is water weight. “Both of these types of losses are quick fixes and do not target fat loss — and may lead to only temporary changes in the scale,” she says. Despite what the trending detox hashtags on Instagram might have you believe, there is no special elixir or food capable of detoxing your body. Why? Because your body detoxes itself — hello, liver and kidneys! — and has been doing it long before detox tea came onto the market. “This includes body parts from the liver to the kidneys — the liver works to neutralize potentially harmful metals and eliminate those from the body, and the kidneys filter out waste substances from the body and help you excrete them,” Gorin explains. But just because your body naturally detoxes itself doesn’t mean you should give up trying to eliminate processed foods from your diet. Eating healthy foods can assist your body in its detoxification process and help alleviate the strain that gets put on your liver and kidneys when you consume copious amounts of junk food. “The more important point here is that the healthy body does a remarkable job of regulating itself and doesn’t need to be detoxed under normal circumstances,” says Gorin. Though some ingredients in detox tea have health benefits (think: green tea leaf, ginger, and lemongrass), the combination of diuretic and laxative herbs in these blends can cause some pretty unpleasant side effects. You’re better off enjoying a regular old cup of unsweetened green, black, or herbal tea without the unnecessary additives. Though herbal teas are less studied, Gorin says the natural ingredients in many of these blends can have health benefits. The only proven way to lose weight is through exercise and smart eating habits. Rather than tossing all your eggs (and money) into the overhyped detox basket, Gorin says it’s better to focus on incorporating regular exercise into your routine, getting adequate sleep, hydrating, moving more throughout the day, and eating a healthy, balanced diet. “A balanced diet includes a mix of fruits, vegetables, protein-rich foods (such as eggs, chicken breast, beans, and milk), whole grains (like brown rice and sorghum), and healthy fats (like avocado and olive oil),” says Gorin. Find out how to start eating clean and how often you should work out for weight loss. The advertisements for detox tea are compelling, but here’s the truth: There’s no one food or drink capable of detoxing your body and curing your weight-loss woes. What’s more, some of the ingredients in detox tea, like laxatives, may even have adverse side effects. Eating healthy foods and staying hydrated can help your body’s natural detoxification process. If you want to slim down, drinking regular tea (sans additives) can be part of your strategy, but the only guaranteed way to lose weight and keep it off is to eat clean, whole foods and exercise consistently.